Mushrooms do not need light to grow – they obtain all their goodness and nutrients from the rich compost in which they grow. 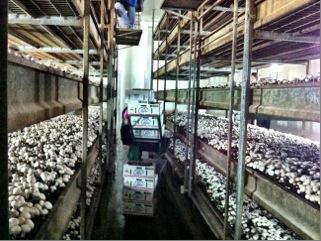 Farmed mushrooms are grown indoors and are available all year round. Good quality wheat straw is wet over several days and then a protein source is added plus gypsum. The gypsum helps to keep the compost open and the protein (often chicken litter) accelerates microbial activity. 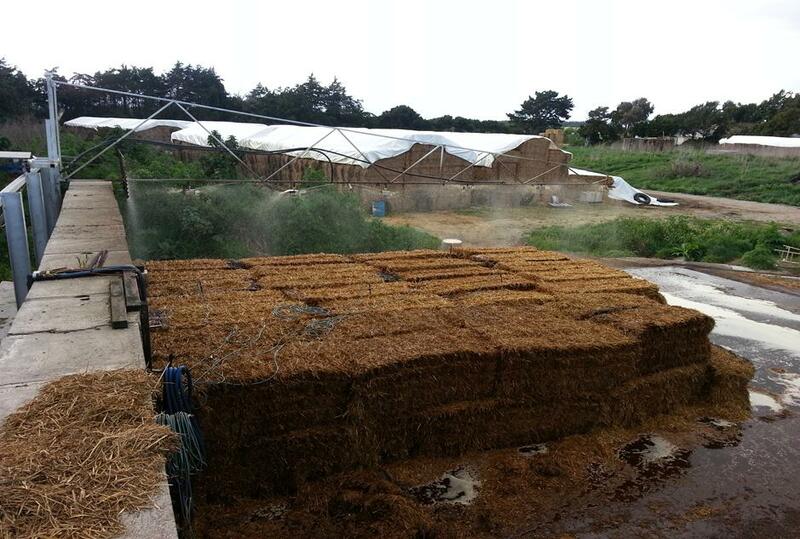 Temperatures up to 84 deg C cook and caramelise the straw making it suitable and selective for mushroom growth. The aim is to compost aerobically so most growers use under-floor ventilation and turn and mix the compost regularly over a 9 to 14 day composting phase. It is amazing to see how quickly the material can convert from dry wheat straw to a very dark homogenous compost if ideal conditions are created. Moisture should be 72%+, protein about 12.5% and microbial activity very strong still. The material is now ready to pasteurise and condition in a specialised well insulated room with a powerful fan, filtration system and under floor ventilation. Air is recirculated through the compost which can be up to 2.5M high. This again is a totally natural process utilising micro-organisms to create the heat. There are five distinct phases. A small amount of fresh air is used allowing the temperatures in the compost to even-up and the microorganisms to become active again. Normally this takes 12-16 hours to achieve 54 deg C+ with medium fresh air (indicating good strong activity). Once the compost is all heating above 57 deg C then minimal fresh air is set and 57-62 deg C should be recorded in the compost for 5-7 hours. Ammonia content in the compost and air will be very strong and this is very important to ensure a suitable kill of unwanted spores, fungi, Nematodes and other unwelcome guests. 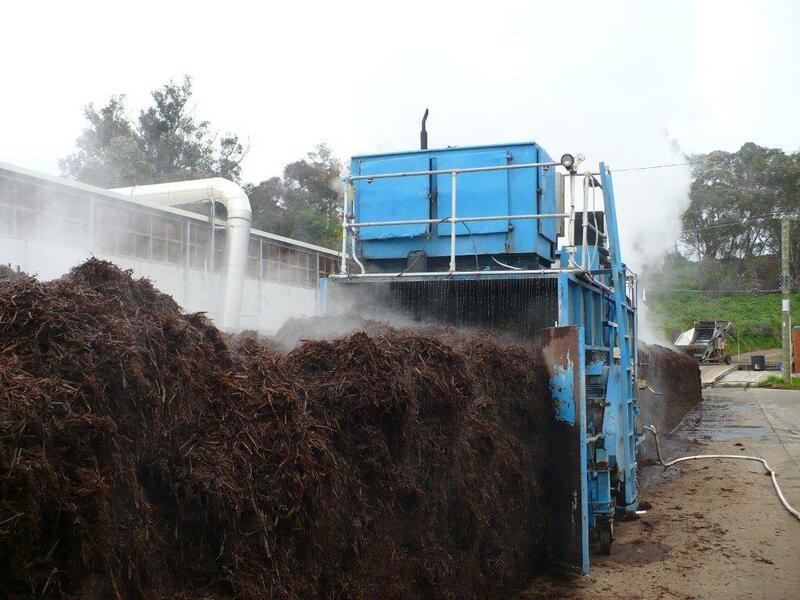 It normally takes about 6-8 hour to reduce the compost temperature to 53-54 deg C and maintain strong natural activity. Over the next 4 or 5 days the temperatures are gradually reduced down to 45-46 deg C in the compost. For the first 2-3 days activity is strong while the micro-organisms lock up all unconverted protein and ammonia and then die off. The exhaust air will now smell free of any ammonia and it is time to cool down to 30 deg C for inoculation with mushroom spawn. The compost is now mixed with spawn of the growers strain and often is supplemented with a matched slow release protein source. There are three distinct ways of spawn running/growing. This is where the compost is put back into a room like the pasteurising room where recirculated air can be pushed through the compost to maintain ideal conditions for mycelial growth( 25-28 deg C and high CO2 levels). Spawned compost is filled onto long shelves 5 or 6 high in the final growing room. The compost is filled into large boxes(normally wood) and placed in a specialised spawn growing room for 14 days. The compost is filled into plastic bags which are normally placed on some sort of shelf system in a growing room. Once the spawn has fully colonised the compost then a 40-50mm layer of casing is added, normally containing casing inoculum(casing spawn). Some growers add supplement now instead of at spawning. The peat mix is added very wet and kept wet while the spawn colonises it (about a week). Once the peat mix is sufficiently grown with mycelium then some fresh air is introduced. By careful adjustment of CO2 (2500-1500ppm), humidity and air temperature, progressivelly small pinheads are encouraged to form and grow-out to button, cup and Flat mushrooms. 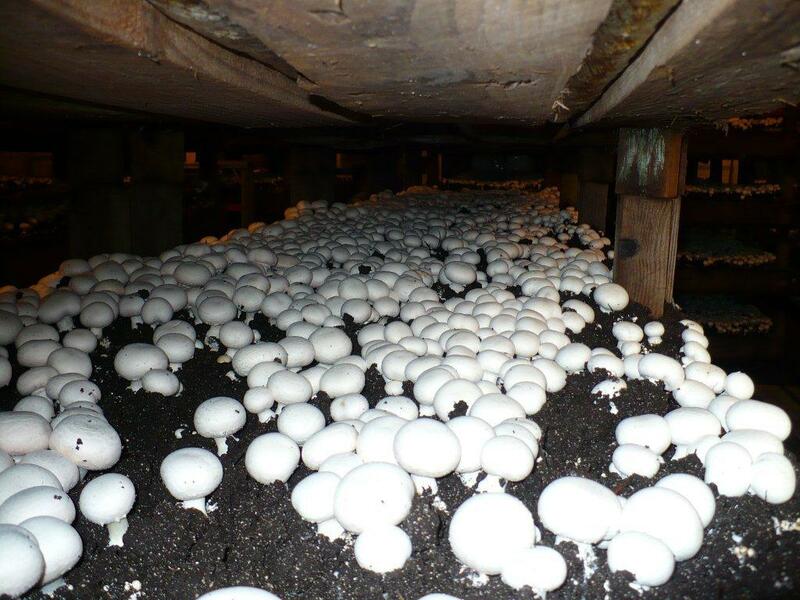 Mushrooms grow in flushes about 7-10 days apart. The first is the most challenging to attain quality and yield. Generally 3 or 4 flushes are taken over 4-6 weeks of picking. 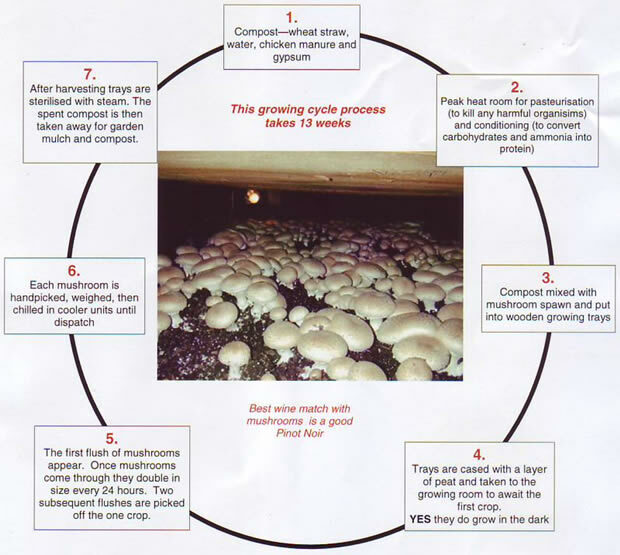 Growers that grow white mushrooms normally pick these as tight buttons and often can pick a crop several times in a day to attain the best quality. 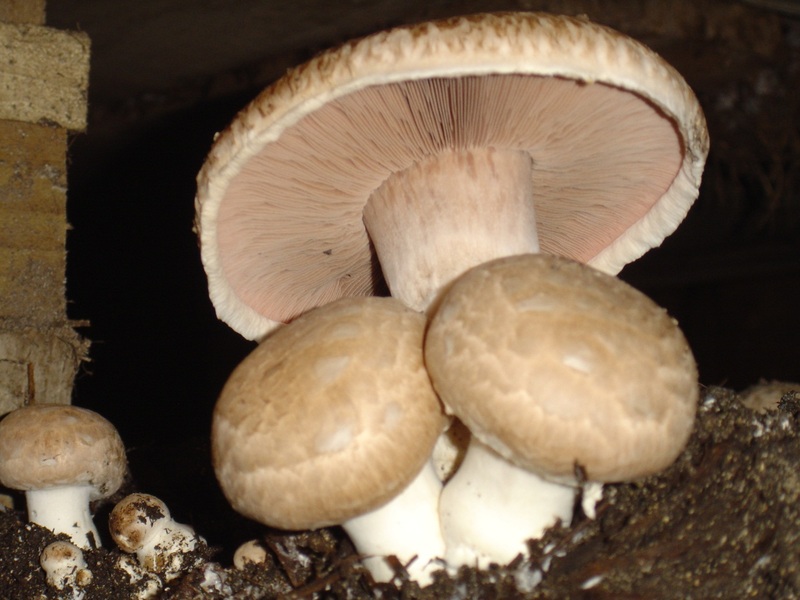 The brown mushroom is generally picked as a flat or portabello. As the crop is harvested the beds or cropping area is tidied of stalks and other mushroom trash and then the peat is wet again for the next flush. 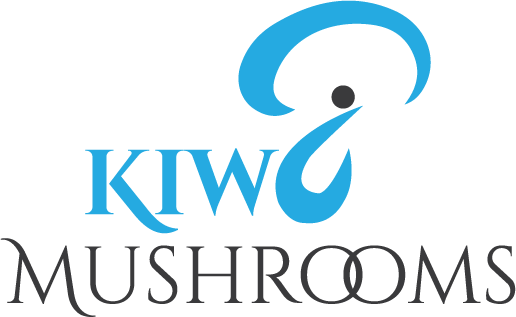 The size of mushroom farms in NZ vary between about 5 ton per week to over 100 ton.